Did you ever wonder what treasures are hidden inside the many chests, cabinets, and desks in Sam Rayburn’s home? The "Artifact Spotlight" offers an opportunity to see and learn about artifacts that are not normally on display within the historic house. We hope to give you further insight into the Sam Rayburn House State Historic Site, "Mr. Sam," and some of his friends and family. Sam Rayburn's parents William Marion Rayburn and Martha Waller Rayburn had 11 children, and most of those children started families of their own. For the April Artifact Spotlight, I decided to research Cecil Evans Rayburn, the wife of Will Rayburn, who died in April 1917. 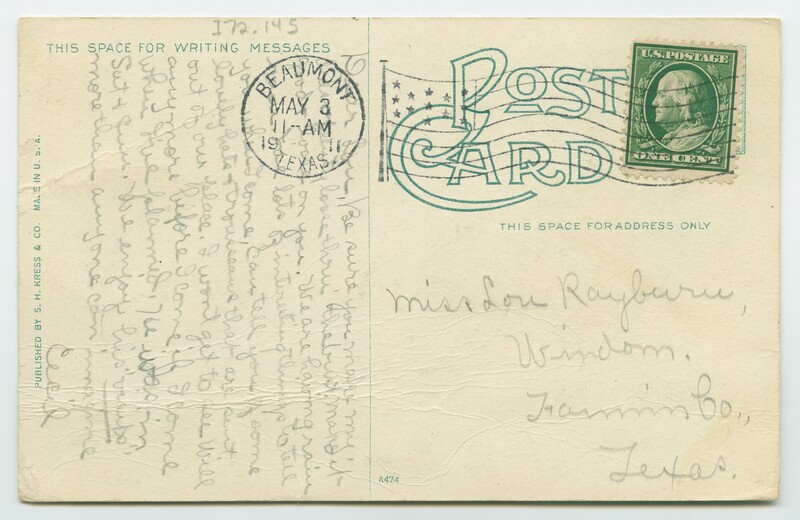 We have one photograph of her in our collection, and some postcards she sent to Lucinda Rayburn. Using Ancestry.com and The Portal to Texas History, a digital primary source repository provided by the University of North Texas, I found several newspapers that discussed Cecil and her family. Cecil Evans was born in Windom in October 1880 to William R. Evans and Belle Evans. Belle maintained the family home, and William was elected to the Texas House of Representatives for Fannin County. Cecil worked as a teacher before and after she married William (Will) Henry Rayburn at her parents’ home on April 25, 1901. Will was born in 1877 in Tennessee. While married to Cecil, Will worked as a traveling salesman, possibly for the Gordon, Sewall, & Co. grocery business. The couple might have lived in Windom or the surrounding area for a few years, and Cecil continued to teach and participate in the Bonham chapter of the Current Literature Club. She presented readings and lectures to the club, including the Robert Browning poem “Fra Lippo Lippi,” a discussion of artists Lorenzo Ghiberti and Donatello, and a discussion of Machiavelli. 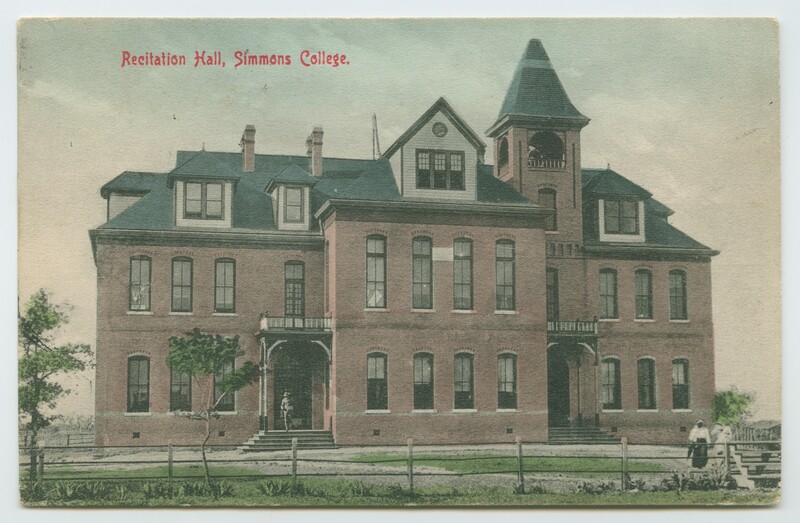 By February 1912, the Rayburns had moved to Beaumont. While there, Cecil was a member of the Woman’s Christian Temperance Union (WCTU), a national women’s organization. At the March 1913 WCTU convention in Jasper, she was elected the president of that district’s WCTU. She also served as one of the many delegates attending the state convention of the WCTU in San Antonio. Cecil joined the First Methodist Church Wesley Bible Class. As of 1915, she taught the class of approximately 100 married women. By 1916, Cecil was also working with the Young Women’s Christian Association (YWCA), and she served on the membership committee. Around May 1916, the Rayburns prepared to move to Oklahoma. Cecil’s friends in Beaumont gave her a farewell party that included providing her with a hand-painted book containing messages from each member of the Wesley Class. A reporter for the Beaumont Daily Journal wrote that the class “is one of the…most congenial groups of Bible students in the city. Their enthusiasm is largely due to Mrs. Rayburn’s own interest in the work and she will be very much missed.” Cecil and Will lived in Oklahoma for a short time before they moved to Houston. 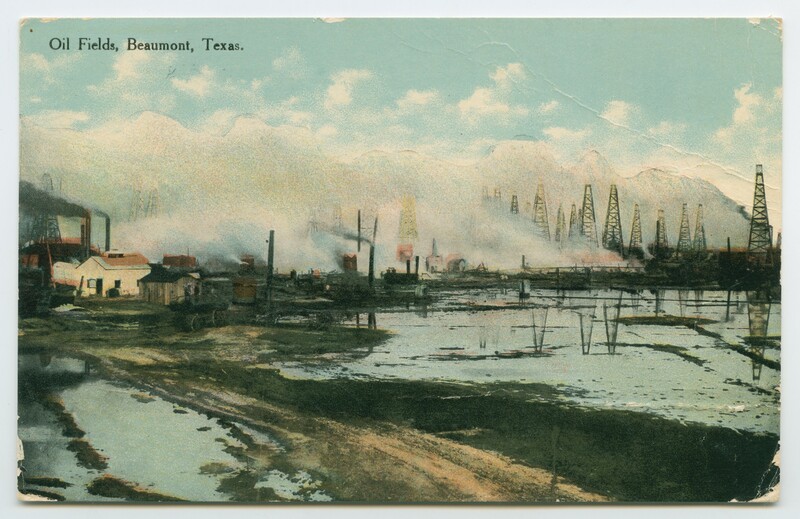 The Rayburns traveled from Houston to Bonham on March 28, 1917, to visit their relatives. Cecil fell ill, and had an operation at Allen Memorial Hospital in Bonham. She died on April 5, 1917, at the hospital. Rev. W.L. Tittle from the First Methodist Church said a prayer over her body in Sam Rayburn’s home before Cecil was buried in Windom. Cecil led an active life full of service to others. She made an impression on her students and friends wherever she went, and maintained an interest in the arts as seen through her activities of reading and singing. What began with one photograph has now become a short biography about Cecil Evans Rayburn, a member of two prominent Fannin County families and a woman who helped others across Texas. 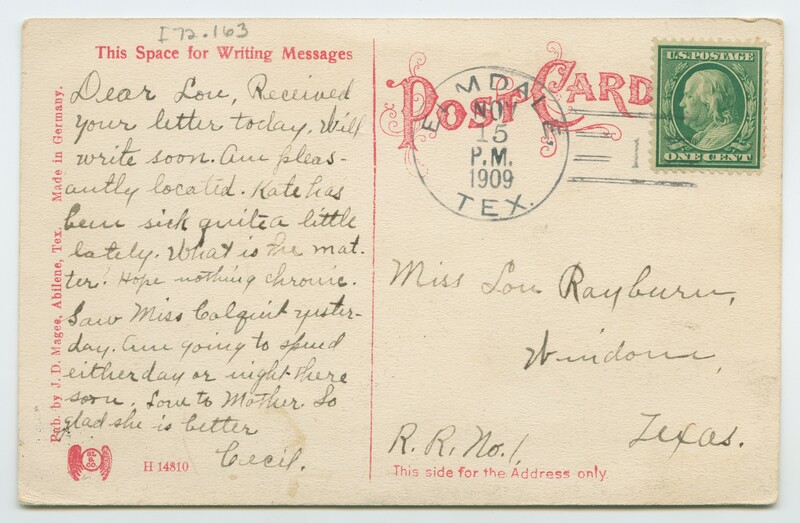 Postcard from Cecil Rayburn to sister-in-law Lucinda Rayburn postmarked in Elmdale, Texas on November 15, 1909.